Are you well-stocked on paint brushes for your next painting project? Do you have a paint project in the near future? Are you well-stocked with paintbrushes? It is important to remember that every type of paintbrush serves its unique purpose and will affect the way your paint will appear on the surface. For more insight, read on to discover the different types of paint brushes. The hair used for natural hair paint brushes comes from Chinese hogs or badgers. They are great for use with oil-based and water-based paint. There are also versions of natural hair brushes made with sable or camel hair, which tend to be more expensive models and used for fine art projects. Badger hair brushes don’t leave any marks and are ideal for use with varnish. Synthetic brushes use polyester or nylon for the bristles. They are rougher than brushes made with natural hair and are great for use with water-based emulsion paints. They act as paint spreaders and work similarly to foam brushes. Synthetic hair brushes are less expensive than natural hair brushes, and the bristles are more likely to fall out while you’re painting. With synthetic brushes, you’ll likely see the brush marks in your painting. Flagged paint brushes feature bristles with ends that have been split. It provides the advantage of applying paint more smoothly, with fewer brush marks because you’ll be able to get more paint on the brush. This is helpful when you’re painting a large surface area. Flagged brushes are otherwise known as “exploded bristle” brushes and are used exclusively with latex paint. Look for those with tapered bristles with the thicker part located at the handle. In addition to the type of bristles used in the paintbrush, the brushes themselves come in different sizes that are more appropriate than others for different types of painting projects. The smallest sizes are often used in fine art while the largest are usually used for painting walls and other large surfaces. 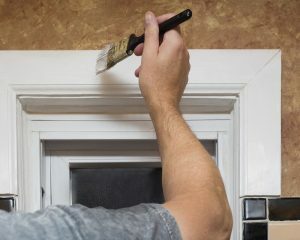 Brushes with bristles that have been cut to a point, or tapered, are great for use when painting corners.